Go Stay Work Play Live: Hello from... Hang on, where am I? Hello from... Hang on, where am I? When last I left you I was on the way to a job in Cairo, which ended up being a good gig. The show was relatively simple, the local staff were lovely (if culturally incapable of getting to work on time) and I even got to have Gerald on the job for the last few weeks. And of course there was a little bit of time to be a tourist as well. 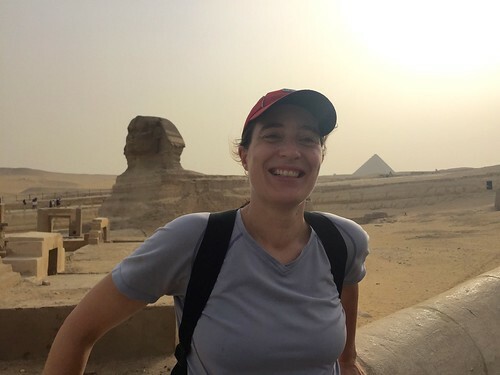 Not my first time at the pyramids, but I am certainly not complaining! Astute Go Stay Work Play readers will recall that the Cairo gig was an unexpected and very last-minute affair. I got the email while I was in Canada and three weeks later, I was in Egypt. The advantage was that it was a pre-existing show so most of the work was in unpacking the props that already existed, running rehearsals, and doing maintenance. Yes, there was stuff to be bought and fixed and generally tarted up. And there was a very green staff of young Egyptian men to be taught from the ground up (starting with “stage left”, and “stage right” and working up from there). But essentially, it was manageable. 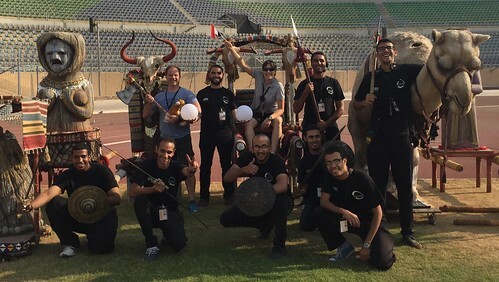 Here's my lovely Egyptian Props Team! As that show drew to a close, my thoughts turned again to my little boat in London and I started to look forward to the down time I’ve been promising myself since Baku. Puttering through boat renovations, slapping a bit of paint on the walls, investigating the worrying squishy spots in the kitchen floor, learning how to light and tend a coal fire properly, and pootling down the canal past bright autumn colours with a pot of something hearty on the stove. Aaaaahhhh! Or… I could agree, after much arm-twisting, to land in London after the Cairo gig, have exactly 43 hours on the ground, and then turn around and board a flight for Abu Dhabi. Of course. If I thought Cairo was last-minute, I had another think coming. I literally got out of the airport taxi and onto the boat, opened my suitcase, extracted what wasn’t needed (tiny plaster pyramids and sphinx keychains, mostly) added a few items I should have had all along (corkscrew and, er, well that's it actually), zipped up the suitcase again and hopped in another taxi to a pleasant hotel room above a pub in Fulham. Total elapsed time on the boat: about 45 minutes. As pleasant as life on the boat can be, and as much as I was looking forward to it, it’s not the kind of thing that’s easy to dip your toe into for short periods. There’s a certain amount of set up and pack down that happens when you leave for longish periods, and I just didn’t have the heart for it this time around. The hotel was easy and central and required no effort beyond the swiping of a credit card. Plus it included breakfast. Sold! And so now I find myself in Abu Dhabi, which astute Go Stay Work Play Live readers will of course recall is the capital of the United Arab Emirates and just down the road from Dubai. Somehow my life is all Middle-East-y these days. The show is a big stadium style affair celebrating UAE National Day on December 2. That’s December 2, 2015. It’s very much in the style of a ceremony like Baku or Sochi, without the sporting event to go along with it. And, of course, without the eight months of lead-time. It’s all happening at a ridiculously breakneck pace. Luckily, the team here is basically the same group of people from Baku, so we’ve all got a shorthand with each other. In many ways its terrifying, but at the same time it’s a bit weird how quickly it’s all coming together. We regularly look up from our feverish tapping on computer keyboards, blink, and say things like, “Why did this always take 4 months before?” and “The first day of rehearsals is always a shambles - it doesn’t matter if you’ve got 6 months or 6 days to prepare for it.” I feel like all those other ceremonies have been training for this - the equivalent of a series of long, slow runs in preparation for a really hard, fast race. There’s no time for second-guessing yourself. You just have to trust that you know what’s needed and push until you get it. There’s no time to think, “maybe we could make this work” or “I guess we could manage with…”. Instead, it’s “If you want this to happen, I must have this, this and this. By Friday.” Invigorating. And did I mention terrifying? As for Abu Dhabi itself, it’s a very different place than Cairo. It’s glaringly obvious that the country oozes money. The roads are clean and wide and uncrowded. Traffic moves smoothly. And there’s no livestock in the streets. This has kind of become my new metric for judging the modernity of a city. How many pens of live sheep and goats do you pass on the streets on the way to work? Also, how many times per day do you come close to flaming death because of the traffic? (Dear Cairo, Love ya! (not really) But oy, you all need to just calm down and back off the gas pedal!) And though our hotel in Cairo was attached to a bafflingly massive Western style shopping mall, with a lot of favourite chain stores and restaurants (including, bizarrely, a Fuddruckers), when you walked outside onto the street you could see that it’ll be a while before that prosperity is widespread. This is not to imply that a shopping mall should be the indicator of having reached the peak of human civilisation. Then again, when you’re disoriented and tired and stressed sometimes the green and yellow gleam of a Subway sandwich shop is like a little beacon of normalcy. Or this! 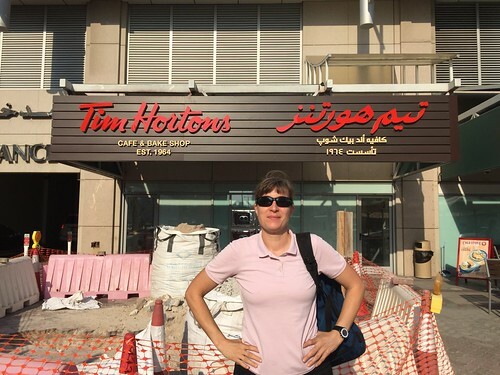 There are Tim Hortons in UAE! Lots of them! I know it’s been a long time since I’ve blogged. I could write volumes about Egypt in general and a whole blog post just about the Egyptian U-turn. And the UAE is fascinating. Did you know that only 12-20 percent of the population are actually Emerati citizens? The rest (myself included, I guess) are foreign workers. I find that staggering. And petrol is about 19 pence per litre. And date palm trees? They're everywhere and they're fascinating. They’re like the buffalo of the desert. Historically every part of the tree is used for something - the dates are harvested and eaten, of course. (Have you even eaten a fresh date? I have, now). 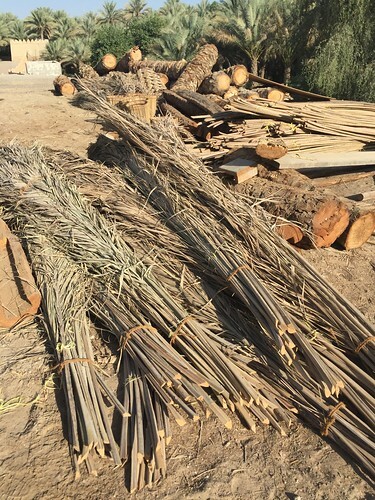 And the fronds are cut down and used for everything from building walls and roofs to weaving baskets. And the trunks are used for heavier construction. Somehow they even make rope from palms too. Date palm tree trunks and fronds, waiting for someone to do something interesting and historical with them, at a festival of traditional crafts in Al Ain. And waiting. And waiting. And waiting. It seems nothing happens before about 5pm there. Which continuously flummoxes we western types who are left to do nothing more than snap pictures of stacks of dried palm fronds and speculate. Prairie kid in the desert! 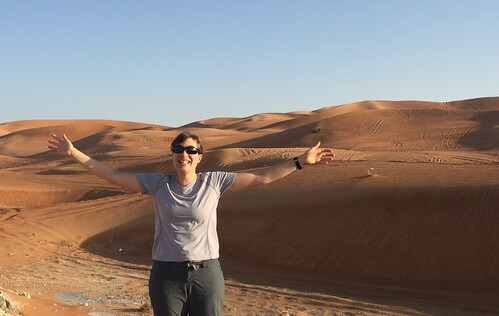 From Saskatoon to Saska-dune: The Pam Nichol Story.